Expert review of Huawei Honor 8 Smart. Check out the price of Honor 8 Smart in India. Compare the design and specs of Honor 8 with other smartphones in the market to choose the best. Honor 8 has hit the markets recently and has been lauded for its performance as well as the thought Huawei has put into it. The gadget is going to rake some moolah for the brand and the fan base of Huawei is really going to get more in the awe. The smartphone has a 5.2-inch screen, a resolution of 1080 by 1920 with the PPI score of 424 pixels per inch. This means that the clarity, colors, resolution and overall screen experience are really good. Honor 8 Smart comes with the in-house CPU of Huawei – the Kirin 650 processor (2GHz octa-core) and has 2 GB RAM. All the memory intensive games and apps can run flawlessly without any lag and the device really doesn't get heated up even when used on full throttle. Though there can be a bit downer as far as the internal memory is concerned. The phone comes with 16 GB memory which cannot be expanded. Other features include the cameras of which the primary or the rear camera is 13 MP and the selfie-taker is 8 MP. The picture quality is really good and the lens adjustments can be made to play with the image focus and other things. The OS is Android 6.0 and the battery is non-removable with a power rating of 3000mAh. The Honor 8 Smart is a single SIM phone and falls in the GSM Category. Connectivity can be achieved via the GPS, Bluetooth, Wifi, 4G and NFC. It has three sensors namely, Ambient Light Sensor, Proximity Sensor, and Accelerometer. This is all about the small introduction to the specifications and configuration of the recent launch of Huawei – Honor 8 Smart. Let us dig some deep and find what consists of the insides and perks this smartphone comes with. 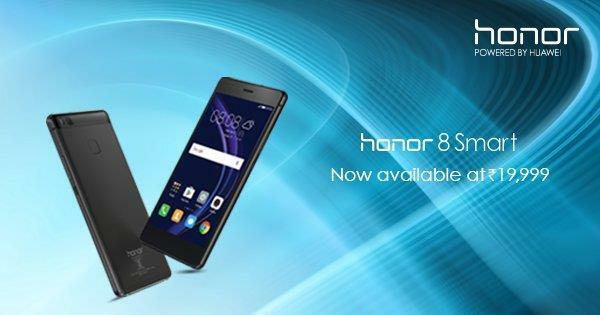 The Honor 8 Smart comes with a Touchscreen Form Factor and has been released in October 2016. The power-packed battery comes with a long life and promise of performance. The battery is non-removable and the overall design is super chic and premium. The designing team of Huawei has really put on its thinking cap this time. The phone is available in Black, Gold and White colours. The touch screen measures 5.2 inches diagonally and the phone reflects the best colours. The sunlight visibility is really good and the video experience is amazing. The striking color combinations, the extensive color palette, and the overall screen performance will not leave you wanting for something more. The phone runs on the 2GHz octa-core Kirin 650 processor and is really fast. There have been no lags in the phone as far as gaming and high-quality video watching is concerned. The Honor 8 Smart doesn't yield into the pressure of multitasking and doesn't get heated up. The 4G band for the Indian users over the LTE is supported. Though the absence of radio and headset can earn some 'OH's'; the performance of the phone has managed to make us all surprised and impressed. Coming to the pricing, the phone has been reasonably priced and has the potential to scale as per the current market trends. Huawei has garnered some positive reviews with the previous launch of Honor7 and the release of Honor 8 and Honor 8 Smart has paved the way for another market hit. As far as the Indian consumer base is concerned, the users are going to love every single feature on the phone and the price will seem reasonable the moment you take the phone in your hand.